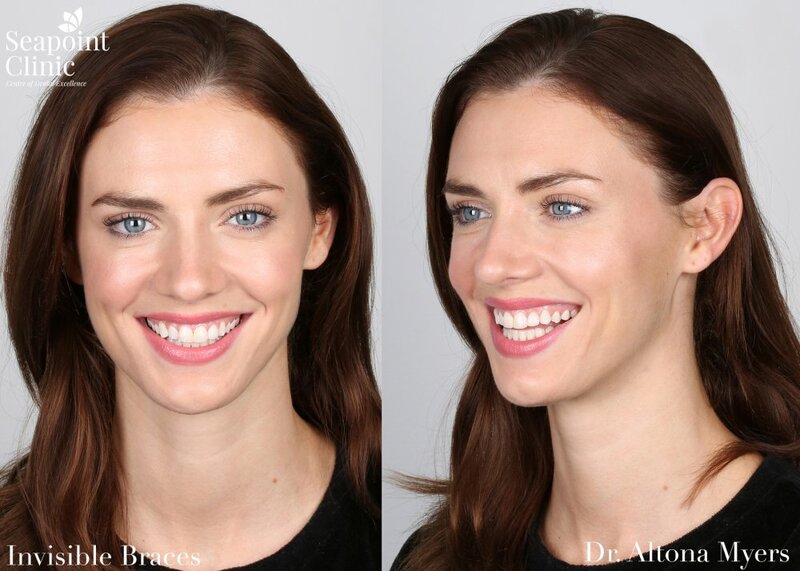 With our most popular choice for tooth straightening you can expect to have the results you want in 6 months or less. That makes it very popular with brides before their wedding or just busy people who don`t want to spend 2-3 years wearing braces. Benefits include a speedier treatment period which is relatively painless and cheaper than other types of braces. Discreet, comfortable, teeth straightening technique. Fixes issues such as overcrowding, misaligned teeth and gappy smiles. I'm over the moon with how my teeth have turned out. I never thought they could look like this. I really can't stop smiling! 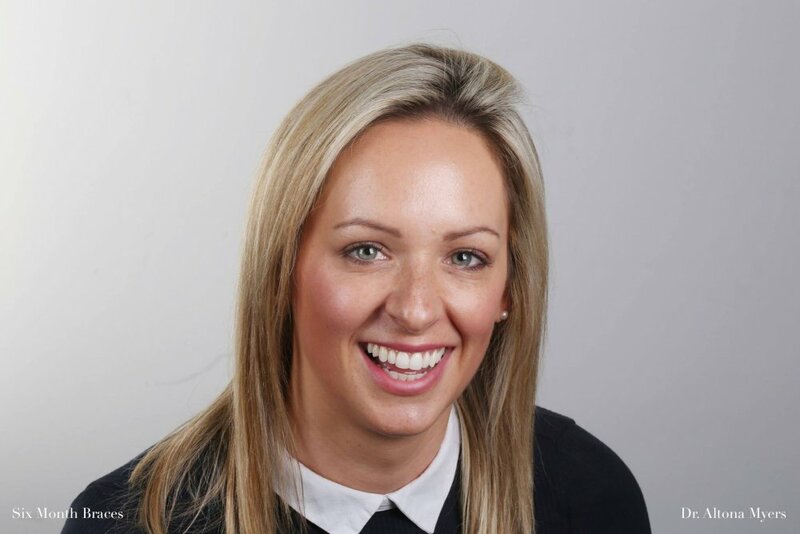 Six month braces are the most popular braces at the Seapoint Clinic and we have more experience of this amazing treatment than any other dental practice. These braces usually involve treating the front teeth only and the goal is to give the patient a great natural looking smile. We do not try to change the bite to any significant degree and the results we aim for are cosmetic only. If your goal is to change your bite or move a lot of the back teeth you may still need to get conventional braces which may take longer. 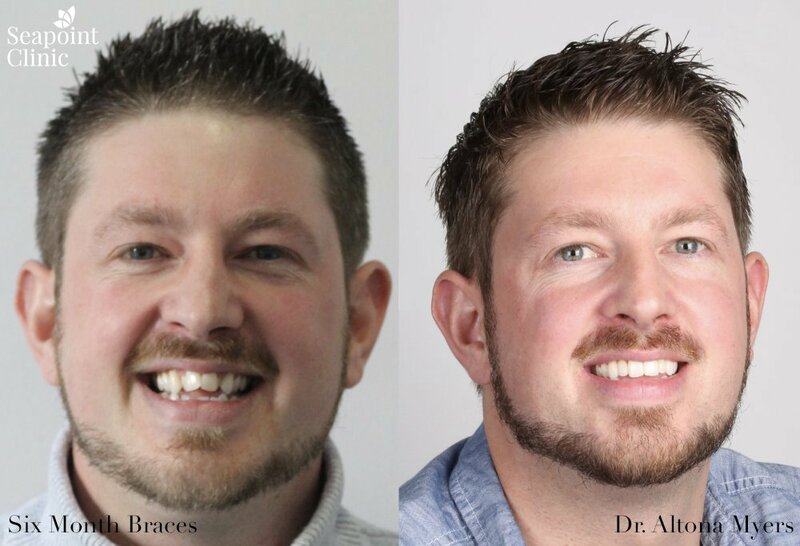 With Six Month Braces we are able to offer both see through braces and metal finish braces. The white braces are tooth coloured and while they do cost slightly more, they are very discreet. These braces are much more inconspicuous than the metal finish braces and often go unnoticed on the patient. They are ideal for those who want their braces to be as discreet as possible. 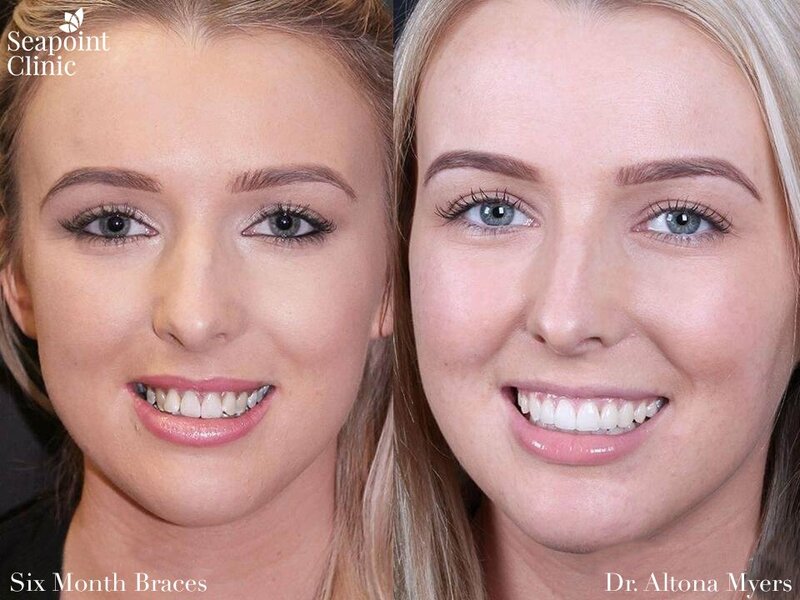 Many patients who come in for Six Month Braces consultations have previously been told that their only option was to wear braces for two years or get veneers. Usually this is not the case, and the smile can be fixed in a reasonable period of time. The Six Month Braces technique utilises the latest technology combined with time-tested techniques to move your teeth quickly and safely. The goal is to give you a great smile and so we only treat the teeth that will benefit your smile. We do not try to alter your bite or back teeth as this is usually unnecessary for cosmetic improvements. Using specialised low force wires we can gently position the teeth in the right place. 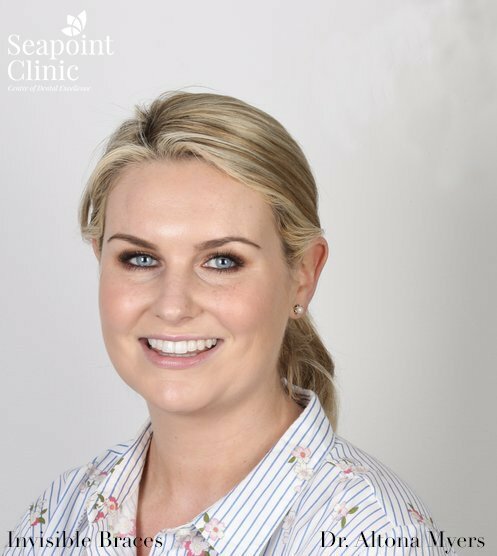 Many of our staff at Seapoint have had six month braces done on themselves and are delighted to tell you about their experience. Six month braces are the most popular way of straightening teeth we have today. I am so happy with my teeth and finally feel free to smile which I have always struggled with. I felt so comfortable since the day I first walked in and cant thank you enough. Many people also consider the option of clear braces to straighten their teeth. Their main advantage is they are clear aligners and can be removed for eating and cleaning. The downside is straightening teeth is not normally as fast or as accurate. There are many tooth movements which can`t be carried out properly with clear braces. Does the Six Month Braces technique use high forces to move the teeth? No. Actually the Six Month Braces Technique is a low force technique. Many people think we just “tighten” the braces more to get the teeth moving. This would actually slow down tooth movement. I'm delighted with the results. Dr Myers was so professional and I can't believe how quick the whole treatment was. Do the Six Month Braces technique damage the teeth, roots or gums in any way? No, the causes for the above complications are individual biology and high forces over a long period of time. The Six Month Braces technique uses low force with a short treatment duration to safely move the teeth. If your teeth are crowded, braces will usually allow you to keep them cleaner which will benefit their health. "I just can’t stop looking at them in the mirror, thanks Dr. Myers!" Absolutely. Many people did not get braces when they were young. Now they have problems with their teeth and gums or they are just unhappy with their smile. Other people did have braces when they were young, but they did not wear their retainers until they stopped growing. The result is that their teeth are now a little bit crooked. Now they are unhappy with their smile so they get braces too. Ask most of our reception or nursing staff who are wearing or have worn Six Month Braces. 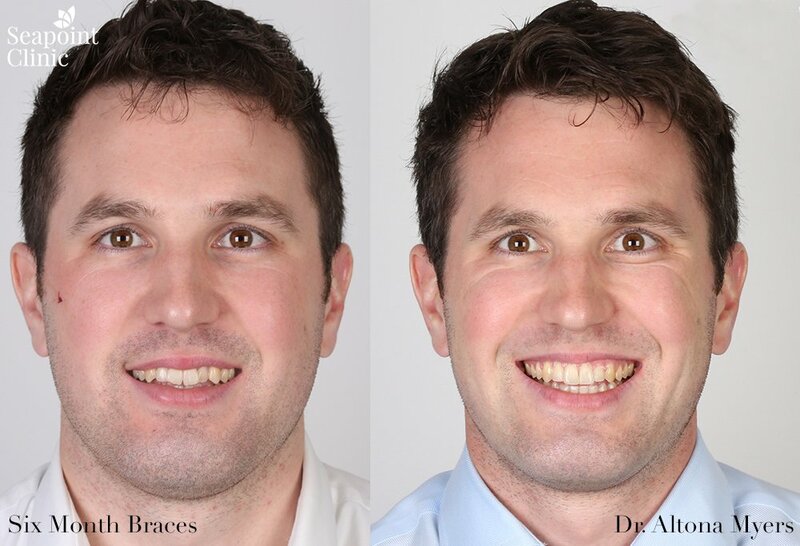 Presently nearly all of our braces are being done on adult patients. It is quite a change from 20 years ago when dentists were generally only treating children. Altona was so helpful throughout the entire treatment which made the whole experience so much easier. My teeth look amazing now, I really can't believe they're mine! What do adult braces feel like? I can't believe the results. Dr Marie Sanfey did a brilliant job and my treatment was finished just in time for my wedding! Yes, you can eat most foods when wearing cosmetic braces. Sticky foods like toffee, should be avoided. Braces do tend to stain a little after wearing them. People who tend to like staining foods such as coffee, curries, red wine etc, sometimes have to cut down. When your braces are adjusted, we change all of the parts that stain and place fresh white/clear ones. So don’t worry if they do happen to stain. Invisalign, the clear brace, can be removed for eating and therefore does not tend to stain at all and can be cleaned easily. Who will perform the treatment for me? The braces treatment will be performed by a dentist trained in the Six Month Clear Braces Technique. All our dentists have performed many cases before and are experienced in the treatments. I'm so happy with the level of care and professional I've received from Dr Altona Myers. I'd highly recommend the braces treatment! This is a removable option suitable when there are only very minor problems which need correction. They are particularly useful after orthodontic relapse. 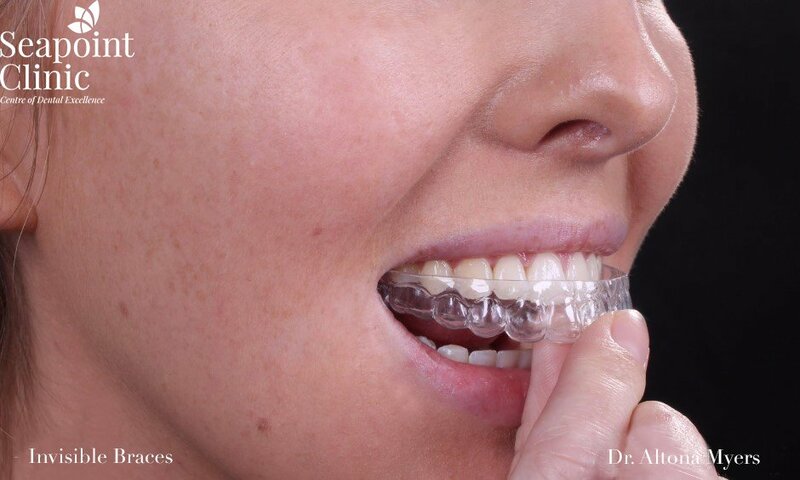 Your dentist can tell you if you are suitable for these aligners. We regularly get referrals from other dentists. However you do not need a referral to see us for treatment. Contact us today on 012842570 to arrange your free consultation. 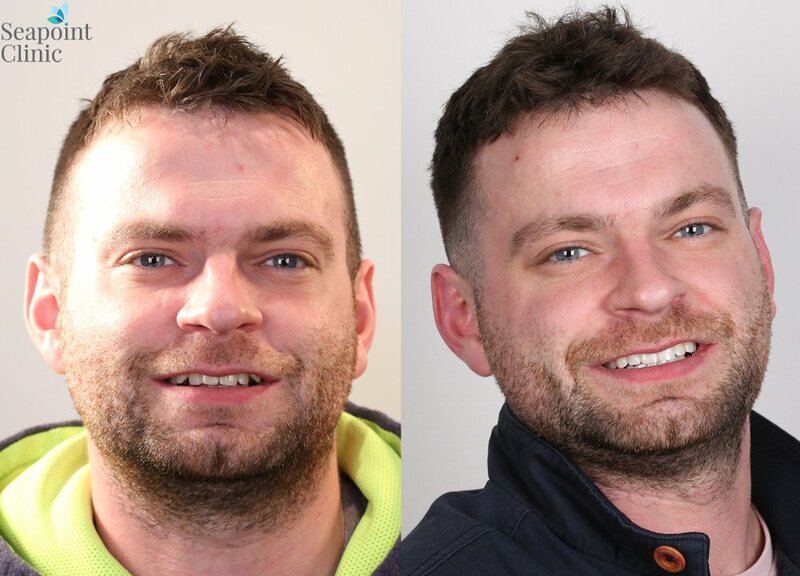 If you have a significant jaw malformation or your teeth bite very badly you may need to get extensive braces which take two years or more. If shorter term braces are not an option for you, we do refer you to our specialist orthodontist for this treatment. I'm so happy with how quick and easy my treatment was and the results are just amazing. Thank you Dr Myers!